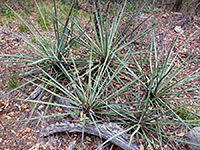 One of the most common yucca of the Southwest, yucca baccata grows in seven states - most of Arizona and New Mexico, plus far west Texas, southwest Colorado, southeast and southwest Utah, south Nevada and the Death Valley area of California. Plants generally remain stemless, but form large clusters. The blue-green leaves are up to 40 inches long, between 1 and 2 inches wide, concave on top and convex underneath, pointing outwards and upwards to create quite a large rosette. 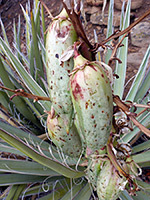 Unlike many other yucca and agave, the cream-colored flowers grow on a short stalk that either stays level with the top of the plant, or rises only a little way above. The inflorescence is usually hairless. The tepals may have a light tinge of purple. Flowers are pendant, and densely arranged. The common name of this species refers to the thick, fleshy, banana-like fruits, up to 9 inches long. 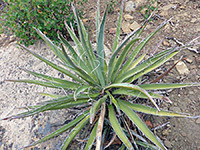 The widespread baccata variety usually remains stemless and has curling leaf edges, while var brevifolia forms a short, often branched stem and has thin, curly filaments along the edges; this latter (known as Thornber yucca) is found only in far southeast Arizona and the southwest tip of New Mexico.